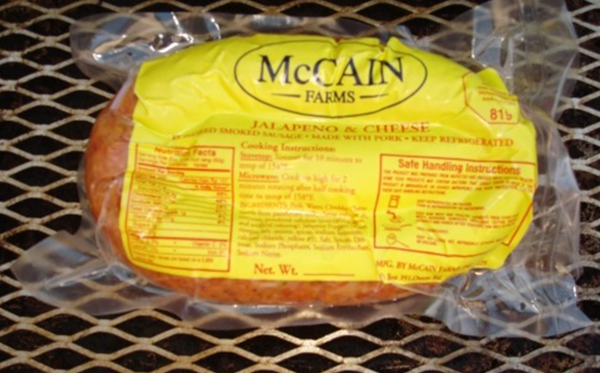 At McCain Farms, we are dedicated to providing high quality products. Our promise is that you will never find a product created with more passion or commitment to quality than ours. 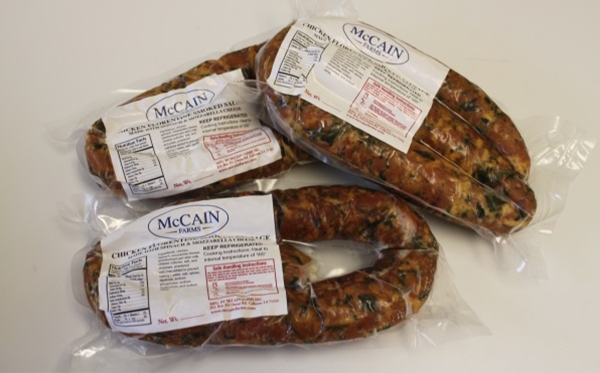 If you’re a spinach lover, this sausage is for you! It’s made with spinach and mozzarella cheese. It’s nothing short of a mouthful of voluminous taste in every bite! This product is sold in house only. Spicy southern style smoked sausage with a taste of sage. Great with any meal or especially made for that appetizer for that outdoor Bar-B-Que. Get it while it’s hot! 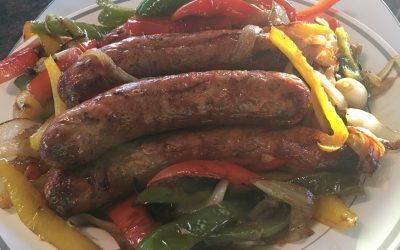 Spice up your taste buds with this fiery sausage. Perfect for any cookout to add that extra kick. This product is sold in house only, and is sold in 3 lb packages. Holiday Hams for the holiday season! A smoked ham for your table. Something to satisfy everyone’s taste buds! This sausage is for the bold & daring. Designed for the grill at the lake or at the camp. One must try it to really appreciate it. Order your turkeys today before they’re all gobbled up! A perfect blend of cheddar and chicken. This sausage is a must have! Perfect for a new variety of taste in your cookouts! This product is sold in house only. 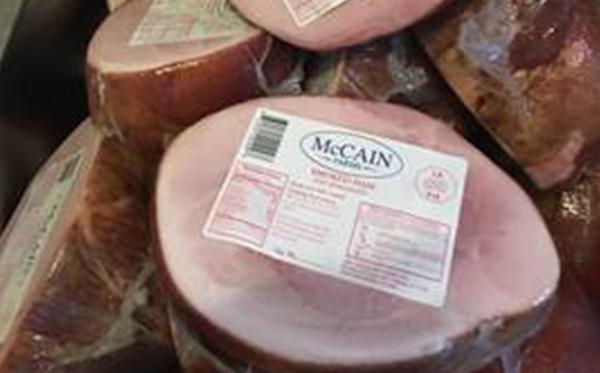 McCain Farms began operations in October 1988. In the beginning, our goal was to process local livestock for area farmers and ranchers. After twenty-plus years of operation, our mission continues. Today, we distribute the same quality products to local businesses and customers, and grocers throughout the area. We now even more than ever custom process for customers who deliver products from the farm to the table by selling at their farms to local eateries and at local farmer markets. 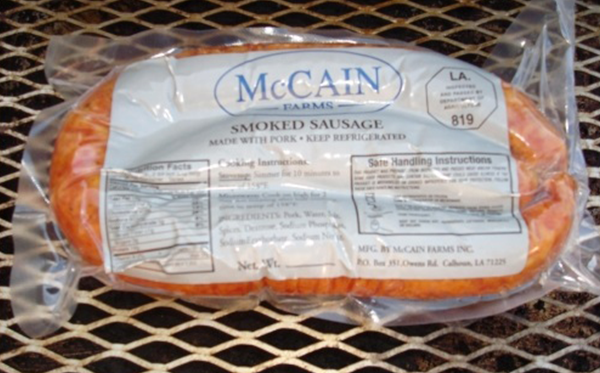 We manufacture smoked meats that are sold to local grocers. 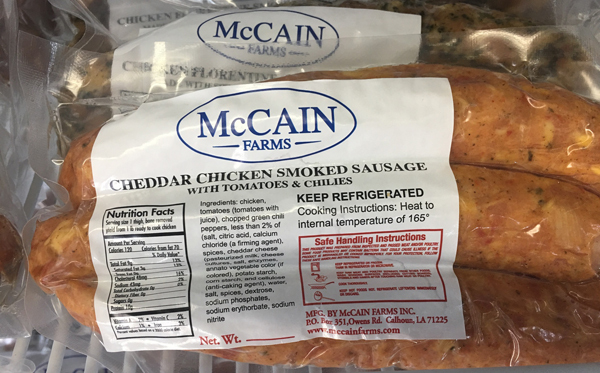 Under our McCain farms label, we produce Regular Pork Smoked Sausage, Jalapeno Flavored Pork Smoked Sausage, and Jalapeno and Cheese Flavored Smoked Pork Sausage. We also private label our products. 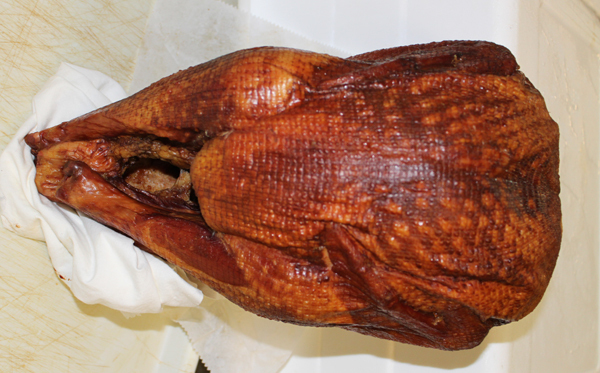 During the holiday season, our smoked hams and smoked turkeys are a great treat. We specialize in selling freezer sides of beef that are raised locally and cut to your specification. 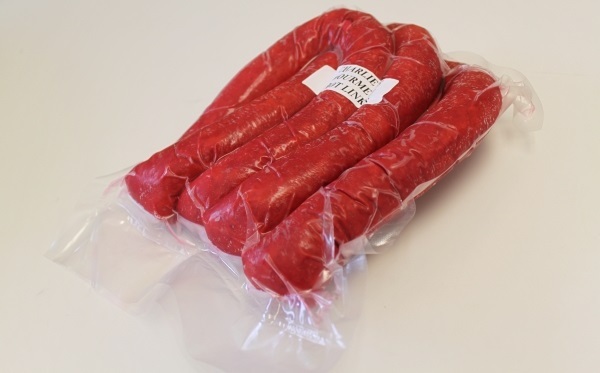 All freezer beef is guaranteed to be grain fed, free of hormones, and naturally aged for a minimum of 14 days. Our customers have an unconditional money back guarantee if they are not satisfied. If you are unable to raise your own livestock, then contact us to set up a side of pork or a side of beef for you. All sides and quarters are raised locally and the beef is aged for a minimum of 14 days. Total satisfaction is guaranteed or your money back. Beef sides are sold by the hot weight per lb. Pork sides for the freezer: market price per lb. on hanging weight. Each order is cut to the customer’s specifications and packaging size. Products are vacuum packaged and frozen to insure freshness and quality. This includes cutting and grinding to your specifications. This includes cutting to your specs and grinding fresh sausage. 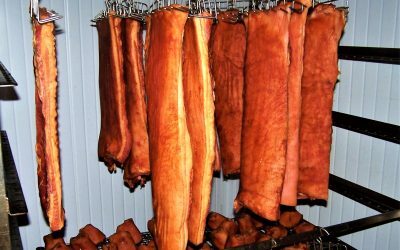 Curing & Smoking: (hams, bacon, etc.) $1.25 per lb. A simple easy Sunday dinner that’s a family favorite. Start your day 30 minutes early. Before your shower, heat oil in an electric skillet or Dutch oven. Cover roast with flour and brown on all sides. Cover roast with water. Turn on high and add onion soup. Go jump in shower. Come back in and add potatoes and reduce heat. You may need to add more water at this time. Add onions and carrots (I have this perfected; you might want to try on Saturday the first time so as not to burn the house down.) Then head to church. It should take a good 2 1/2 hrs to cook. Come in from church, serve dinner and then tell your wife you cooked, she can clean the dishes! Only one cook dish to wash. Serve with cornbread. Always let your meats reach room temperature if possible before adding it to the heat. When seasoning your steak if you think you have enough, add some more. Too many people never add enough. 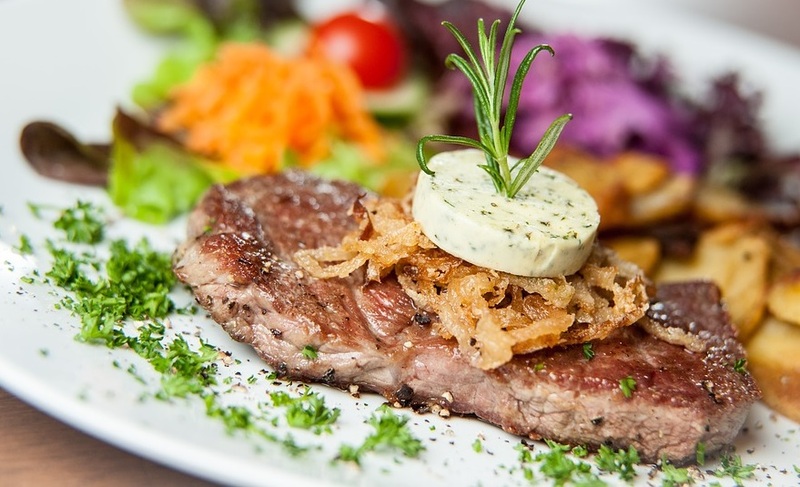 Let your steak rest at least 5 minutes after taking from the grill. This lets the moisture and flavor absorb into the meat. Most importantly, never ever cut into a steak while it’s cooking to see if it’s done enough. Everybody has done this once, even me. But if you do it often you will notice all the flavor oozing out and that’s not good. Easy recipe – I usually make it on Sunday so it will be best Monday night. Sautee onions, pepper, and garlic. (You may substitute seasoning blend available at your local grocery and minced garlic). Add this to beans in big pot, bring to boil and reduce heat. Cook about 2 hours on medium heat. Add rest of meat ingredients and water if necessary, and cook 1 hour or until done. Serve with hot cornbread and over rice. Actually this is better once it’s reheated.